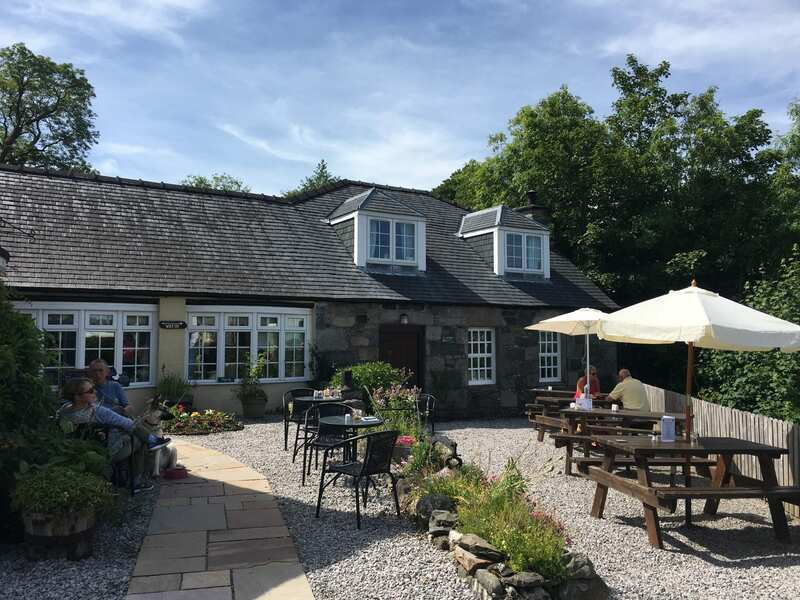 Just before we entered the Galloway National Park, we rode past a rather small, yet cute looking café, with a delightful little garden at the front. As our route was a loop around the National Park, we decided that we would stop off at the end for some lunch in this hidden treasure. We certainly made the right decision stopping off at The Smithy New Galloway! Although the café has no car park, or at least not that we could see, it is rather easy for bikers to park in front of the café, on the road. Naturally, in this area of the UK, there is virtually no traffic and so the bikes felt perfectly safe there. In order to enter the café, you walk through a small, paved, pretty garden where there are several tables to sit at, to eat out in the fresh air. These tables are rather small but considering how isolated the café is in Scotland, I doubt you would struggle to find a seat or merge tables. If you choose to sit outside, the garden is adjacent to the Mill Burn which means you can eat whilst listening to waterfalls. Despite there being tables in the shade and in the sun next to some stunning flower beds, both Inigo and I are practically allergic to the heat, so we decided to sit inside. As we wondered in, we were greeted by huge smiles and welcoming voices. We were told to find a table and that table service would follow. This little place reminded me of The Linton Kitchen but with a Scottish flare. Its disjointed tables and chairs, tartan patterns and brick walls gave the place a great personality, which was only accentuated by the excellent music playing in the background and the kind staff. The menu was also very appealing, including a wide range of options. I loved how healthy the menu was too! It was filled with fresh, light options and the sides were mainly vegetable, pulse, salad and grain based. No greasy cheesy toasties to be found here, but rather homemade tartlets and soups. Inigo ordered eggs with chips and I ordered a scampi pitta bread. When placing my order I was told that the dish came with three optional sides but as I am not a fan of mayonnaise and tomatoes I declined them. The next thing I knew, the cook came out and offered me some chips and various other options as a side, believing that the pitta itself would not be enough. I found that to be a truly personal touch to my experience at The Smithy New Galloway, which makes me remember the place fondly. Considering my dislike for mayonnaise, the homemade lemon mayonnaise that appeared as a side on my plate was truly delicious, in fact, the whole pitta was! You could tell in every bite that the ingredients were locally sourced, that the condiments were homemade (including Inigo’s ketchup) and that the menu had been well thought out. As Inigo put it, even his fried eggs tasted as eggs should. It is safe to say we wiped the plates clean! Naturally, being on holiday, a main is followed by a dessert. There were hundreds of options in this little café. Two that appealed to me were written up on the specials of the day, however we ended up sharing the millionaires shortbread and the rocky road. Yet again, they were scrumptious and I was rather annoyed that I could not try a slice of each option. Following a break by visiting the souvenir part of the shop, which stands adjacent to the dining area, we completed our meal with a HUGE Italian hot chocolate. I would say that Inigo and I expected more from this drink considering how it was sold to us by the staff, but it was still nice. Regarding the shop, The Smithy New Galloway café sells stuffed Highland cows, jewellery from the area, paintings and mugs. You can find these things elsewhere but I thought it was a sweet idea to have a stand there. Overall, the food at The Smithy New Galloway is excellent. You can tell the establishment is family run and that the ingredients are sourced from local producers. Everyone was so lovely, helpful and welcoming, that we left wanting to visit again. To make things better, considering all we ate, the meal was incredibly cheap – perfect! Sounds lovely. I must make a point of visiting when next in Dumfries and Galloway. Yes, most definitely worth a visit!